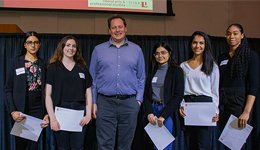 More than one hundred undergraduate students enrolled in programs the Faculty of Liberal Arts & Professional Studies (LA&PS) were honoured April 2 at the eighth annual Celebration of Student Academic Excellence held at the Second Student Centre on the Keele Campus. The reception, which recognized achievements from the 2017-18 school year, was MCed by fourth-year political science student Leslie Quintanilla. In total, 124 LA&PS undergraduate students were recognized for their academic achievements. LA&PS Interim Dean J.J. McMurtry also congratulated the students on their success. Calling the event one of his favourite jobs as dean, McMurtry also took a moment to congratulate the professors and teaching assistants for their hard work and support. “This year, we are recognizing more students for academic excellence than ever before. And while this is evidence of your efforts, it also reflects the quality of our incredible professors, TAs and faculty,” said McMurty. The Dean’s Award for Academic Excellence is awarded to students who achieve the highest sessional grade point average (GPA) on a minimum of 30 credits at each year level. Honourable mentions are given to students who achieve an 8.5 or higher sessional GPA on 30 or more credits. The LA&PS International Student Award for Academic Excellence is given to international students with the highest sessional GPA based on a course load of at least 30 credits in each of their first, second, third and fourth-years. Honourable mentions are given to students who achieve an 8.0 or higher sessional GPA on 30 or more credits.